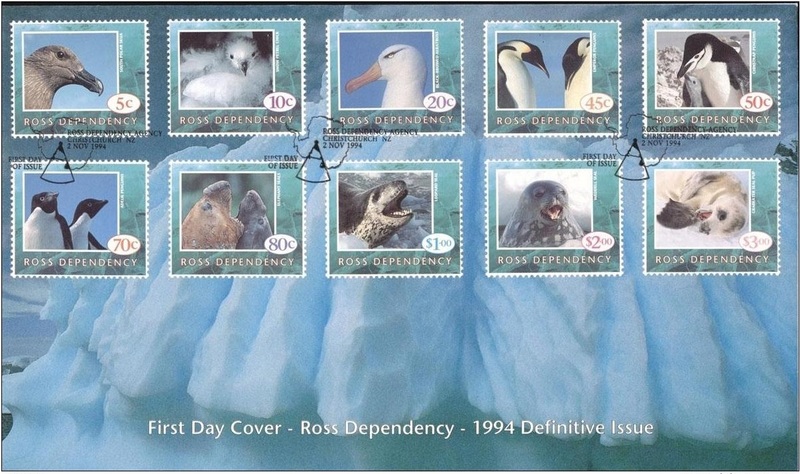 Virtual New Zealand Stamps: 1994 Ross Dependency Wildlife Definitives. 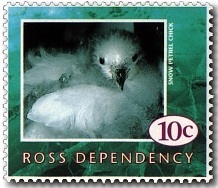 1994 Ross Dependency Wildlife Definitives. 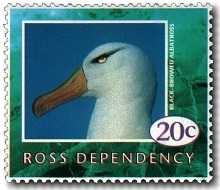 Short History of Ross Dependency Stamps. 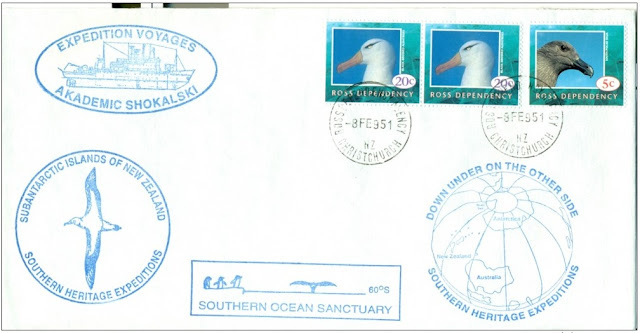 The first stamps inscribed Ross Dependency were issued on January 11, 1957, in conjunction with the New Zealand Antarctic Expedition, led by Sir Edmund Hillary (part of the Commonwealth Trans-Antarctic Expedition). Before the expedition left New Zealand, on 23 November 1956, Hillary had been appointed postmaster. When the expedition chose the site for Scott Base, a post office was established, initially in a tent. The initial set of stamps consisted of four stamps, in the denominations 3d, 4d, 8d, and 1s 6d. When New Zealand adopted decimal currency in 1967, the stamps were reissued in denominations of 2c, 3c, 7c, and 15c. A new definitive set, consisting of six stamps denominated 3c, 4c, 5c, 8c, 10c and 18c was issued in 1972. The next set, issued in 1982 to mark the 25th anniversary of Scott Base, consisted of 5c, 10c, 20c, 30c, 40c and 50c stamps. 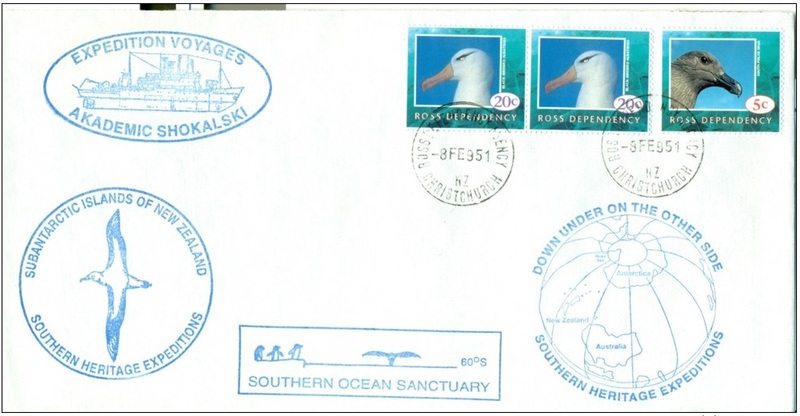 The post office at Scott Base was closed in 1987 as part of the rationalisation of New Zealand Post. 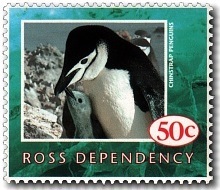 Mail from the base was handled in Christchurch, and the issuing of “Ross Dependency” stamps ceased. New Zealand Post resumed the issue of stamps inscribed “Ross Dependency” in 1994, “due to local and international demand.” A definitive set was issued in 1994, and pictorial sets of five or six stamps have been issued annually since then. The denominations match those of contemporary New Zealand stamps. However, the stamps are not generally valid on New Zealand mail. 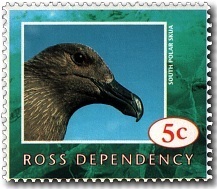 Mail from the Ross Dependency is processed by the “Ross Dependency Agency”, located at a post office in Christchurch. 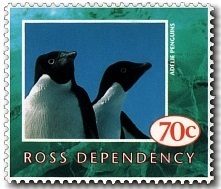 Members of the public (mostly philatelists and stamp dealers) are able to post items bearing Ross Dependency stamps at this office. 5c - South Polar Skua. 10c - Snow Petrel Chick. The south polar skua (Stercorarius maccormicki) is a large seabird in the skua family Stercorariidae. An older name for the bird is MacCormick’s skua, after explorer and naval surgeon Robert McCormick, who first collected the type specimen. It breeds on Antarctic coasts, usually laying two eggs in November and December. It is a migrant, wintering at sea in the Pacific, Indian and Atlantic Oceans. In the eastern North Atlantic, it is replaced by the great skua. South polar skuas have been seen at the actual South Pole itself. The snow petrel (Pagodroma nivea) is the only member of the genus Pagodroma. It is one of only three birds that breed exclusively in Antarctica and has been seen at the South Pole. It has the most southerly breeding distribution of any bird. Breeding occurs in colonies on the Antarctic Peninsula, and various Antarctic islands. One white egg is laid between late November and mid-December. The egg is incubated 41 to 49 days and the chick is brooded for 8 days. They fledge 7 weeks later in late February to mid-May. 20c - Black-Browed Albatross. 45c - Emperor Penguin. The black-browed albatross (Thalassarche melanophris), also known as the black-browed mollymawk, is a large seabird of the albatross family Diomedeidae; it is the most widespread and common member of its family. The black-browed albatross is a medium-sized albatross, at 80 to 95 cm (31–37 in) long with a 200 to 240 cm (79–94 in) wingspan and an average weight of 2.9 to 4.7 kg (6.4–10.4 lb). It can have a natural lifespan of over 70 years. The emperor penguin (Aptenodytes forsteri) is the tallest and heaviest of all living penguin species and is endemic to Antarctica. The male and female are similar in plumage and size, reaching 122 cm (48 in) in height and weighing from 22 to 45 kg (49 to 99 lb). The dorsal side and head are black and sharply delineated from the white belly, pale-yellow breast and bright-yellow ear patches. Like all penguins, it is flightless, with a streamlined body, and wings stiffened and flattened into flippers for a marine habitat. 50c - Chinstrap Penguin. 70c - Adelie Penguin. The chinstrap penguin (Pygoscelis antarctica) is a species of penguin which inhabits a variety of islands and shores in the Southern Pacific and the Antarctic Ocean. Its name derives from the narrow black band under its head which makes it appear as if it were wearing a black helmet, making it one of the most easily identified types of penguin. Other common names are "ringed penguin", "bearded penguin", and "stonecracker penguin" due to its harsh call. The Adélie penguin (Pygoscelis adeliae) is a species of penguin common along the entire Antarctic coast, which is their only residence. They are among the most southerly distributed of all seabirds, along with the emperor penguin, the south polar skua, the Wilson's storm petrel, the snow petrel, and the Antarctic petrel. They are named after Adélie Land, in turn, named for Adèle Dumont D'Urville, the wife of French explorer Jules Dumont d'Urville who discovered these penguins in 1840. 80c - Elephant Seal. 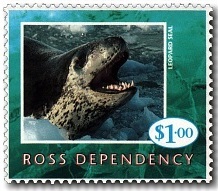 $1.00 - Leopard Seal. Elephant seals are large, oceangoing earless seals in the genus Mirounga. The two species, the northern elephant seal (M. angustirostris) and the southern elephant seal (M. leonina), were both hunted to the brink of extinction by the end of the 19th century, but the numbers have since recovered. The southern elephant seal is found in the Southern Hemisphere on islands such as South Georgia and Macquarie Island, and on the coasts of New Zealand, South Africa, and Argentina in the Peninsula Valdés, which is the fourth-largest elephant seal colony in the world. The leopard seal (Hydrurga leptonyx), also referred to as the sea leopard, is the second largest species of seal in the Antarctic (after the southern elephant seal). Along with all of the other earless seals, it belongs to the family Phocidae and is the only species in the genus Hydrurga. The name hydrurga means "water worker" and leptonyx is the Greek for "small-clawed". The leopard seal is large and muscular, with a dark grey back and light grey on its stomach. Its throat is whitish with the black spots that give the seal its common name. Females are slightly larger than the males. 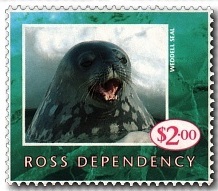 $2.00 - Weddell Seal. 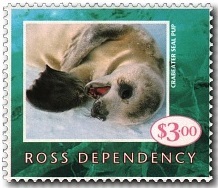 $3.00 - Crabeater Seal Pup. The Weddell seal was discovered and named in the 1820s during expeditions led by James Weddell, the British sealing captain, to the parts of the Southern Ocean now known as the Weddell Sea. However, it is found in relatively uniform densities around the entire Antarctic continent. The Weddell seal, Leptonychotes weddellii, is a relatively large and abundant true seal (family: Phocidae) with a circumpolar distribution surrounding Antarctica. Weddell seals have the most southerly distribution of any mammal, with a habitat that extends as far south as McMurdo Sound (at 77°S). The crabeater seal (Lobodon carcinophaga or carcinophagus) is a true seal with a circumpolar distribution around the coast of Antarctica. They are medium- to large-sized (over 2 m in length), relatively slender and pale-colored, found primarily on the free-floating pack ice that extends seasonally out from the Antarctic coast, which they use as a platform for resting, mating, social aggregation and accessing their prey. They are by far the most abundant seal species in the world. While population estimates are uncertain, there are at least 7 million and possibly as many as 75 million individuals. 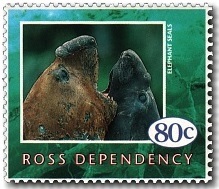 1994 Definitive Issue - First Day Cover. 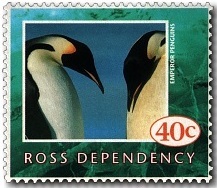 40c - Emperor Penguin / Reduced Standard Letter Rate. It would have been expected that since the 45c value was only on issue for one year it would have increased in value against others in this set but this doesn't appear to have been the case. I think this would partly be due to 45c, being the standard letter rate, would have been much more common that other values. We are still looking for the First Day Cover - dated 2 October 1995.
with New Zealand - Ross Dependency stamps. Annual New Zealand Stamp Collections.